Living wills and health care proxies — documents known as advance care directives — give you a voice in decisions about your medical care at the end of life. Without these documents, choices may be left up to a doctor or a judge — someone who does not know your values, beliefs, or preferences. 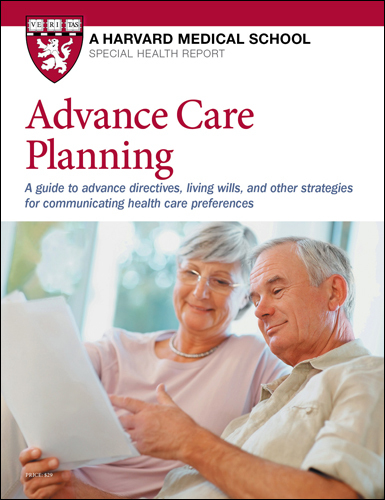 This Special Health Report, Advance Care Planning: A guide to advance directives, living wills, and other strategies for communicating health care preferences, will help you plan ahead and create legal documents to guide decision makers at this important time. 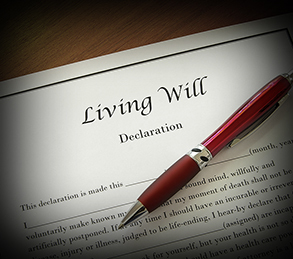 Many people shy away from preparing a living will or health care power of attorney, perhaps because it’s difficult to ponder death, or they aren’t sure what their end-of-life wishes are, or don’t know how to go about doing it. But taking some time to think about what kinds of medical treatment you would or wouldn’t want if you were unable to speak for yourself is can be a blessing for your loved ones. Living wills and health care proxies — documents known as advance care directives — give you a voice in decisions about your medical care. Yet only a quarter or less of Americans have filled out advance directives. Without these documents, choices may be left up to a doctor or someone appointed by a judge — a person who may not know your values, beliefs, or preferences (your health care philosophy). Not only is it possible that the care you receive isn’t in keeping with your wishes, but this also may be a great burden on a loved one, who is forced to make difficult decisions without knowing what you would want. So take the time to learn about and complete the necessary forms — the sooner the better. This report walks you through the process, explains the medical terms and procedures you’ll need to know, helps you determine what kind of end-of-life care you would want, and even provides the forms you’ll need. Which advance directives do you need? What are your goals for care? Who needs to have your advance directives? When faced with big decisions in life, it always helps to think ahead. Can I afford to buy a new car or a home? When can I afford to retire? Where will I live after I retire? Yet many of us shy away from one very important decision: What type of medical care do we want if we’re too sick, confused, or injured to voice our wishes? Surprisingly, estimates suggest only 4% to 25% of Americans have documented their desires for care during severe health crises. When the sun is shining and life is busy, it’s all too easy to sidestep thoughts of death. But while you may be in robust health today, an emergency, such as a car accident or a stroke, could certainly occur. Or you might be diagnosed with a severe, life-threatening illness. At the very least, what will be true for most of us is that our health will eventually decline after a long, full life. If you haven’t prepared advance directives, medical choices will be left to worried relatives or to a doctor or a guardian appointed by a judge, none of whom may have a clear understanding of your values, beliefs, and preferences. What makes life worthwhile to you — physically, emotionally, spiritually, and intellectually? What would matter most to you during your final weeks or days? What kind of care would you want to receive? Though these questions are complex, and perhaps upsetting, they are well worth your attention. So give yourself time to think about them. The information we’ve gathered for this special report can help answer many questions surrounding end-of-life issues. After you read it, I urge you to talk to your primary care doctor, if you haven’t already done so, about what’s possible and what feels right for you. Then fill out advance directives — a health care power of attorney or living will, or both — that reflect your beliefs. And share your thoughts with those whom you love and trust. In these pages, you’ll find a practical guide to help you accomplish these tasks. Let it spark important conversations — with yourself, your doctor, and those who care about you. By taking these steps now you’ll ease the stress and confusion your loved ones will face if they have to make decisions for you without any guidance about what you would want. All of us will die one day. That’s a basic truth. Ultimately, this report is about how you choose to live — all the way to the very end.